Philips are hosting a special competition on Saturday 24th, where they will have a bespoke 1980s-style arcade game machine in Broadway Market, that you can play on, and win prizes. It finishes at 5pm (quite early for a lot of the readers, I know) so don't turn up too late. "YouNeedToHearThis.com & Philips Headphones bring you a new sound experience. It’s part music video, part video game and all yours to control. 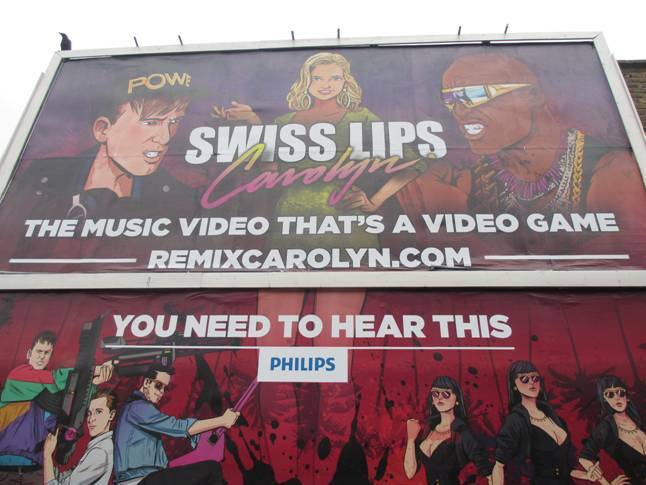 Now you have the power to remix Swiss Lips’ latest track ‘Carolyn’ and create your own music video just by playing this game. We’ve had built a bespoke 80’s style arcade games machine which will be popping up at the bottom of Broadway Market, Hackney (at the poster site - see pic above) this Saturday 24th August 9.00am – 5.00pm. Passersby can come along, play on the arcade game to remix the Swiss Lips track and also be in with a chance of winning a pair of Philips Downtown Denim headphones to take away on the day."